Kitty cats, you all know how much I adore surprises. In fact, they rank right up there with my obsession for all things glitterific; which is why I had to share this petite present from my bloggy friend Meream of Bored & Crafty as part of her Scraplink Saturday series. I "met" Meream months ago through a mix of her fabulous posts on All Women Stalk, and her sweet as chocolate-truffle-center-cupcakes-from-NYC's-Magnolia-Bakery comments on my daily posts, and have adored her ever since. Only a few short weeks ago did I so much as discover that she had her own blog (a must for you DIY-ers who love to get crafty), and now this. Pink, cupcakes, coffee, glitter, and even one of my all-time favorite Cafe Fashionista quotes...it's quite obvious that Meream knows exactly the way to my heart. You know I love you, darling! Check out Meream's Cafe Fashionista feature here, and do make Bored & Crafty a daily bloggy visit. It's good for the artistic soul, my loves! Thanks to Bored & Crafty for the picture. Love "Cookies for Breakfast" these are too cute for words! And I think you've turned me onto Help Remedies...I'd much rather pull these from my bag than a huge bottle of Tums or Tylenol! Sorry, still kind of orgasming over the layout to pay attention to much else. Oh how fun ma cherie! 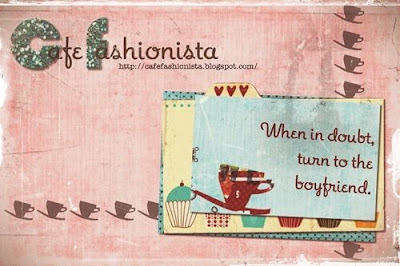 What nice sentiment...and very good quote...for bf sweaters haha! That is so sweet! Its such a wonderful design! Yay for getting it!! This is absolutely adorable -- she sounds like a sweetheart. And her blog is darling! wow! that's very great surprise. so sweet!